For the project we were determined to locate one of the Super Efficient Refrigerator Program (SERP) units since we had seen how well they perform in a previous monitoring project. The 25-cubic foot side-by-side refrigerators feature an advanced compressor, vacuum panel insulation and fuzzy logic defrost control. They also use very little electricity compared with most models with through-the-door features. Unfortunately, the model we needed, the ED25PS, had been discontinued and Whirlpool had no more in their warehouse. Luckily, we got in contact with Sears. 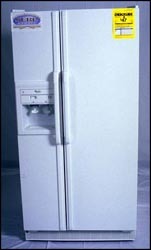 Whirlpool had produced a copy cat of the ED25PS, the Kenmore 55792. Unfortunately, we soon discovered that the unit could only be sold in the service territory of utilities that sponsored its development. But fortunately, we got in contact with Josephine Mestas, in Consumer Relations with Sears. In some impressive sleuthing, Josephine tracked down one of the Kenmore units on the sales floor in San Leandro, California. We then had the unit shipped direct from Sears to Lakeland, Florida. It arrived on October 20th and is ready for installation. Special thanks to Sears; they really helped out with a difficult problem.